Hi there! Just popping in to share my weekend looks with you – I had a good mix of a relaxing and busy weekend, just the way I like it with multiple opportunities to put together some fun outfits….just the way I like it!! 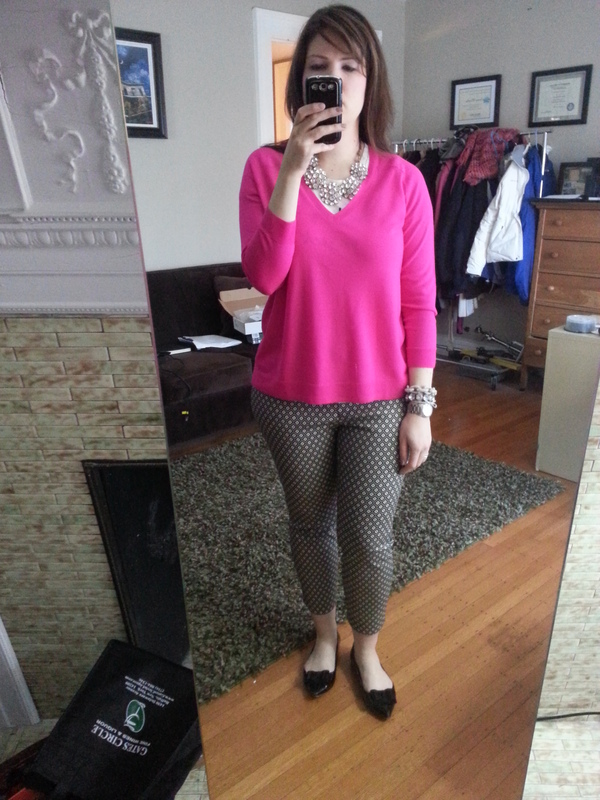 And now that I’m tallying up my outfits I realized it was an exclusively J.Crew weekend…surprise surprise!! 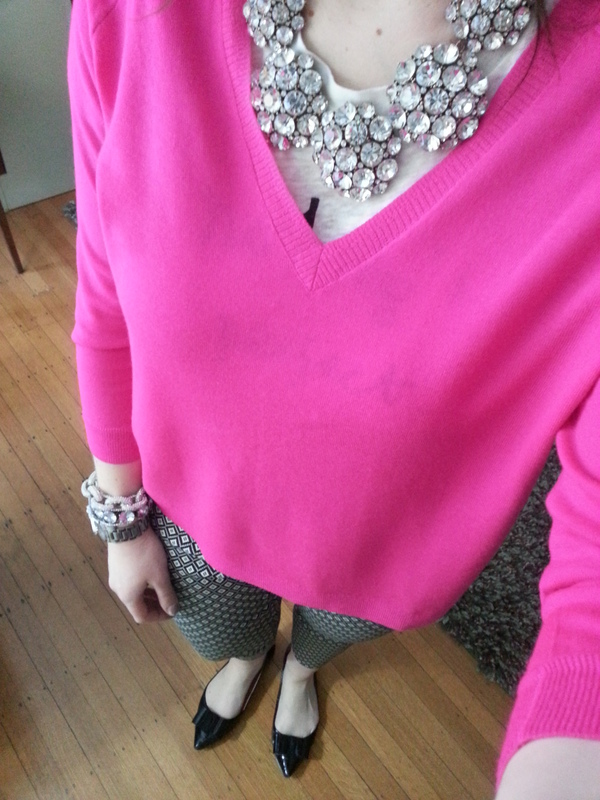 First up – Friday – work and aftewards a trip to the mall for a little bit of (J.Crew!) shopping and dinner and a movie (Divergent) with one of my girlfriends. This sweater is hands down my new favorite hot pink. I’m in love. I’ll be honest, I only wore this for a few hours – I can’t wait to have another day to get a full day out of it! 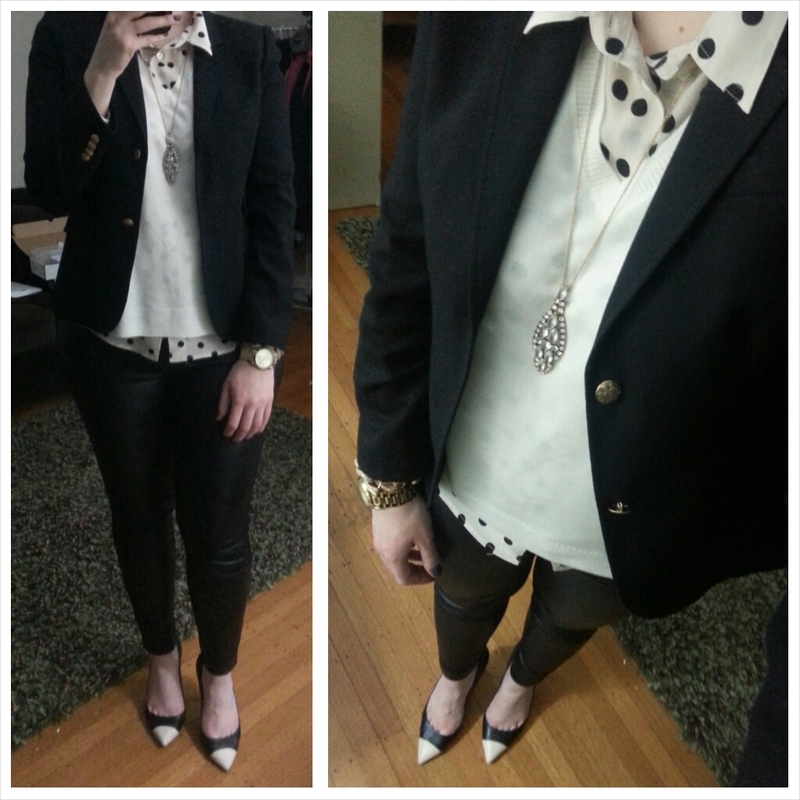 Outfit #3 – Date night dinner! Any excuse to wear my J.Crew leather front pixie pants….I don’t think I’ve blogged about just how much I.LOVE.THESE.PANTS. I scored these pants on serious promo + additional markdown and while they were still a bit of a splurge I feel a total rockstar in them. I’m still trying to figure out how I can swing wearing them to work (I’m still not that adventurous). In the meantime I’ll settle for wearing them out to dinner and as many places as possible. 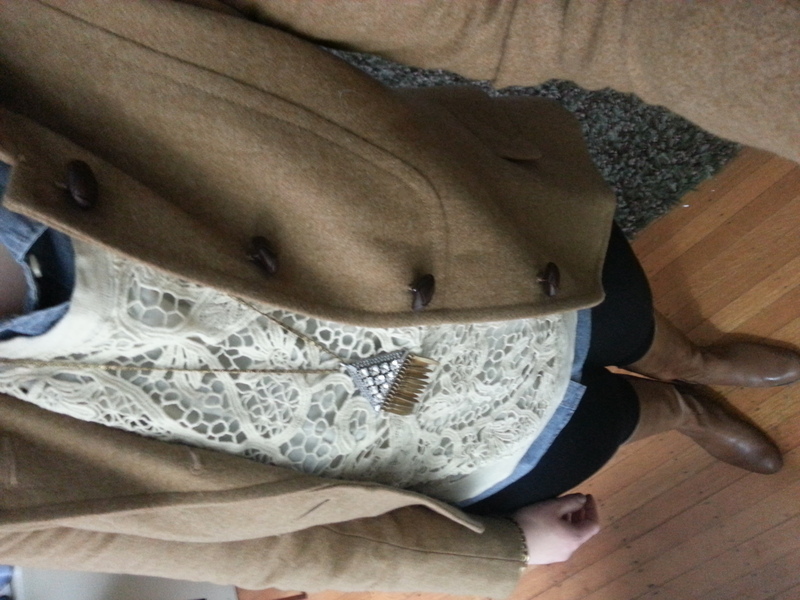 And my final casual Sunday look…running a few quick errands. 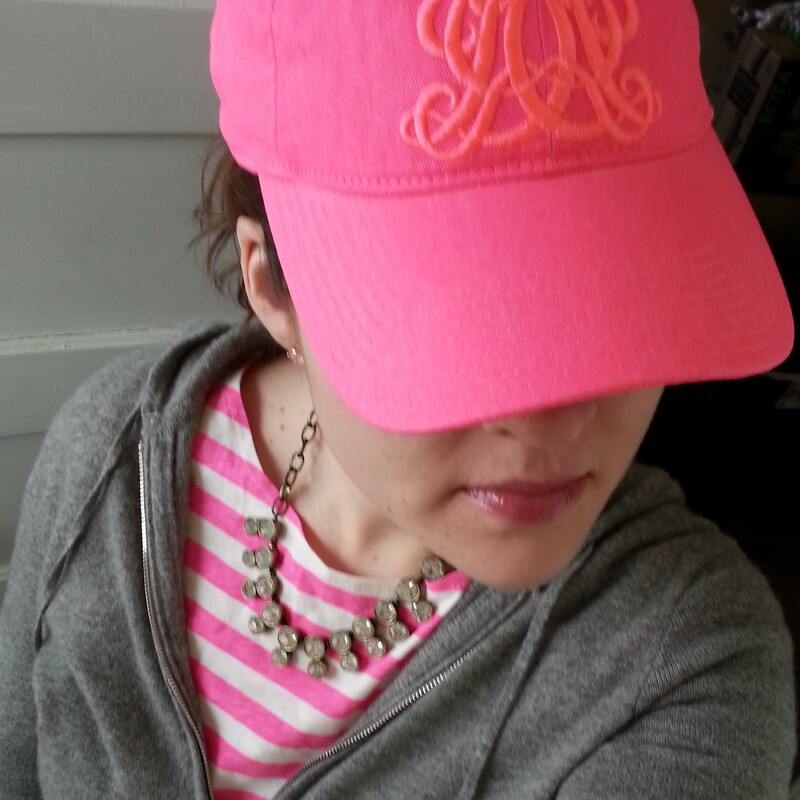 I’m not a big hat person, but I couldn’t resist the J.Crew Embroidered Emblem Baseball Cap for a mere $8 on Friday. So, there you have it, my looks from the weekend! Any favorites? Would love to hear what you think and thanks for visiting! !